Google Nexus for Sony leaked in new images? Talk around the web has focused on the LG Nexus 4 a lot lately. In fact, there are whispers of a rumored Google/LG collaboration that would bring the Korean company into Google's notoriously off-limits Nexus fold. However, photographic evidence of another Nexus manufacturer may have surfaced over the weekend, this time with Sony branding. 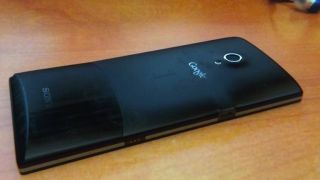 The images, reportedly taken with a Samsung Galaxy Nexus, popped up on Picasa and show off a handset filed as the "Sony Nexus X." Both pics depict a Sony Android sans Xperia branding, a sign the images could be completely fake. Pasted on the back of the phone, under the camera, is Google's logo, while the front is completely devoid of marking, similar to the LG Nexus 4 images leaked last week. Also visible is the spring-loaded dock connector oriented at the edge of the device, similar to the one found on the Galaxy Nexus and not the one found on other Sony phones like the Xperia V.
A sign of possible fakery, The Verge pointed out, is the front's shoddy icon alignment. A CNET source said last week that LG might not be the only company bringing about a new Nexus, so these images, if authentic, would back up those claims. In other Nexus news, Jason Parks, a Google software engineer, posted some photos of his sleeping son to his Google+ page over the weekend. While his kid might not like the whole world seeing him slumber, Google and LG might be a little peeved at the engineer as the photos were reportedly taken with the not-yet-revealed Nexus 4. The camera data was gathered via EXIF info in the "Photo details" link to the side of the images. Someone who works for LG Electronics also reportedly posted photos taken with the Nexus 4's snapper on Google+, but those images were subsequently taken down from the site. Tune into TechRadar for all the latest Nexus leaks, rumors and news. Hopefully, we'll see sort of confirmation for these items soon.